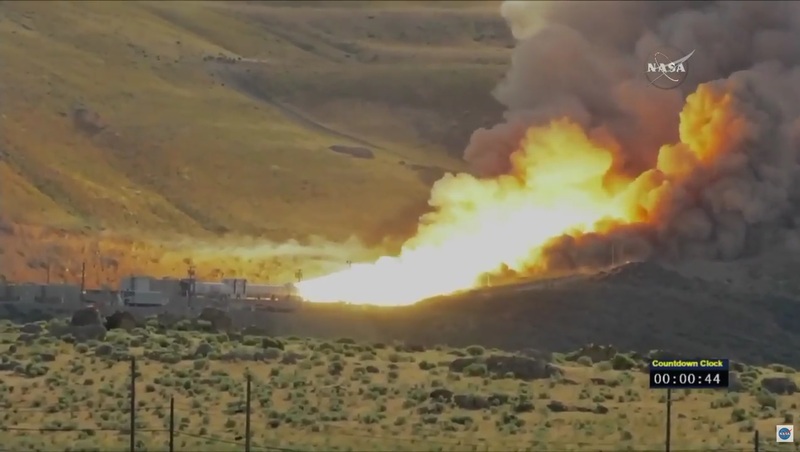 Suspended in a horizontal position and held firmly to a giant block of concrete embedded in a mountain, the booster began breathing fire at 15:05 UTC for a two-minute and six-second burn. 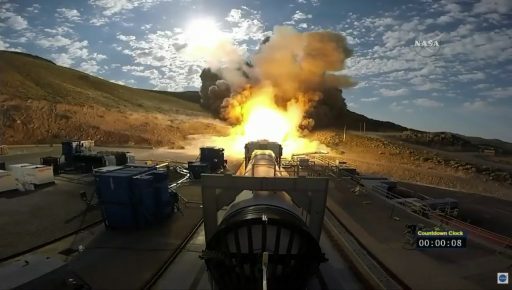 While sand was turned into glass at the business end of the booster, hundreds of data channels were recorded to obtain a full picture of the rocket’s operation throughout the burn on a path to clear the five-segment booster design for the first SLS flight in late 2018. A crowd of 10,000 gathered to watch the motor come to life followed six seconds later by the arrival of the shockwaves and the rumble of raw rocket power. 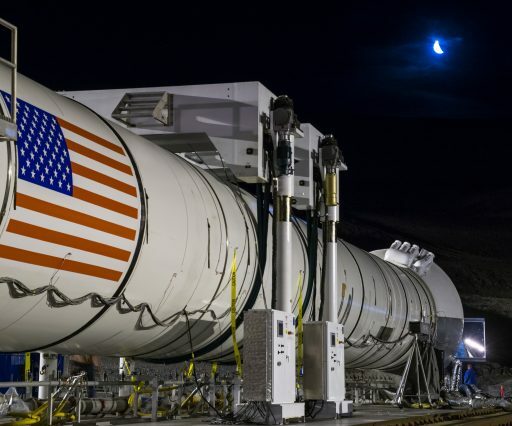 Qualification Motor 2 built on four prior tests of the Orbital ATK-built SLS Solid Rocket Booster (SRB) – three horizontal test firings as part of the development program in 2009, 10 and 11 and QM-1 in 2015 that marked the first of the two Qualification Tests. The test program aimed to validate the thermal and structural dynamics of the five-segment Solid Rocket Booster that –although using Shuttle heritage – had to go through a full testing program due to the addition of a booster segment that increases the total impulse delivered by the SRB by 25% – a necessity when looking at the missions to be performed by SLS. 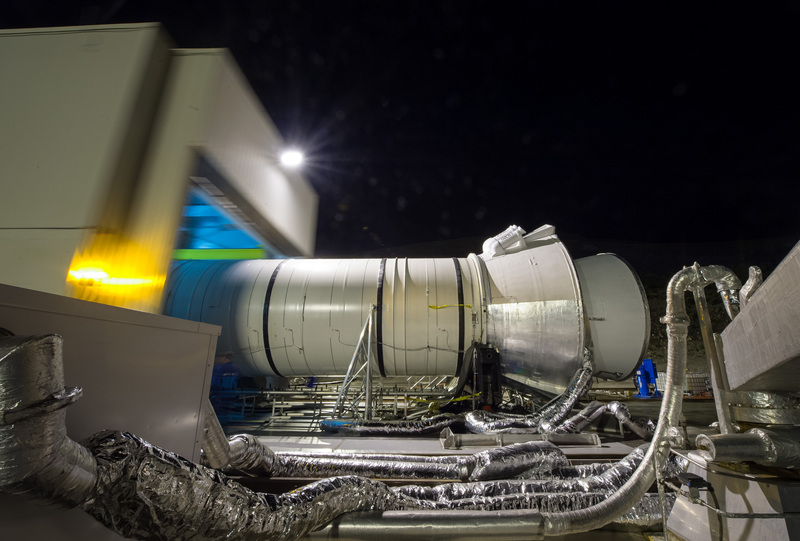 The Development Tests as well as the Qualification Tests demonstrated the operation of the boosters at their upper and lower temperature limits of 4 and 32 degrees Celsius, requiring the large rockets to be conditioned for several weeks prior to the test firings. QM-2 had been in a 4°C environment since early May to ensure the desired Propellant Mean Bulk Temperature would be achieved on test day. Measuring 53.95 meters in length and 3.71 meters in diameter with a total mass of around 725 metric tons, the five-segment SRBs are the largest solid rocket boosters ever built for use aboard a space launch vehicle. They use the same rubber-textured propellant formulation as the Space Shuttle that relied on its twin four-segment boosters for the first two minutes of flight, delivering the majority of thrust needed to lift the vehicle off the ground. Teams at Orbital ATK’s T-97 test stand at the Promontory facility began final preparations for the test at 11:05p.m. local time, setting up for an early morning ignition – keeping temperature considerations in mind when selecting the test time. 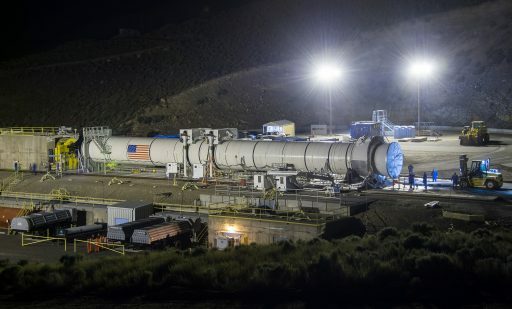 Six hours ahead of the expected ignition, teams completed the rollback of the protective housing that provided the thermal environment for the booster by using multiple air conditioners for the last six weeks to chill the booster. While sitting in the open, the booster’s joints were continuously cooled to be kept at the low operating temperature up until ignition. A delay of one hour had to be called when a computer sequencer controlling the test showed a problem, requiring hardware to be replaced and re-tested to ensure all support systems were ready for the test. The sequencer recycle showed good results and teams proceeded into the formal one-hour countdown to power up the last measurement systems and initiate data recorders – all controlled from a command bunker near the test stand. 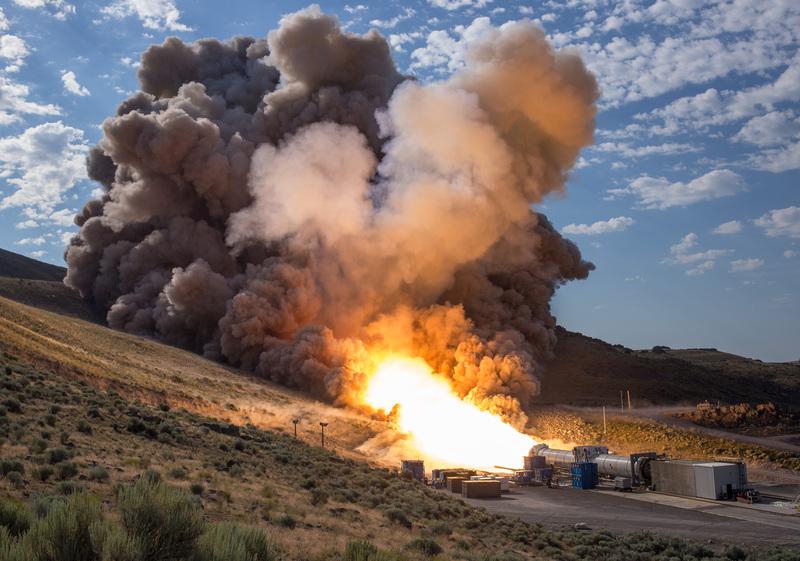 Smoke and fire erupted from the booster at 15:05 UTC as it thundered to a total thrust of 14.7 Meganewtons (1,500 metric-ton force) – generating about 8% less thrust than QM-1 last year that was fired at the upper temperature limit. A myriad of sensors and recorders captured over 500 data channels throughout the 126-second firing to provide information on the performance of each and every element of the booster to fulfill 82 specific objectives set for the QM-2 test. 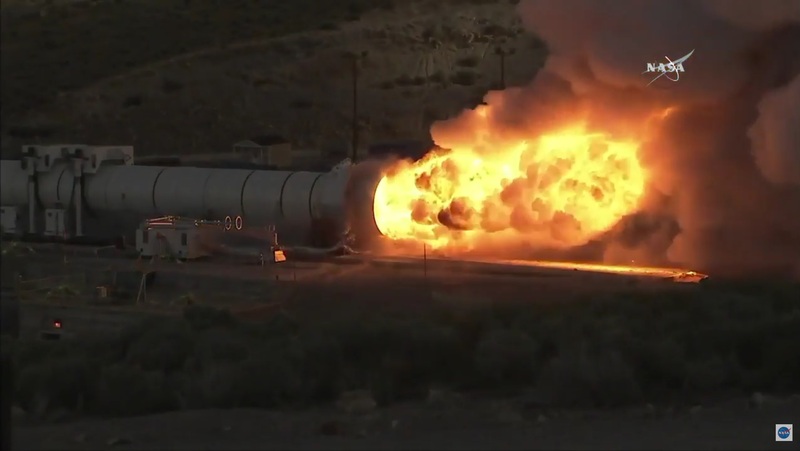 Exhaust gas escaped from the nozzle at over three times the speed of sound and the booster burned at temperatures over 3,000°C, employing a new type of insulator between the packed propellant and the 12.4-millimeter thick steel casings. The asbestos-free insulator is one of several modifications from the Shuttle-design booster to the version flying on SLS. The SLS booster features a modified nozzle assembly and a completely new avionics system to increase the overall robustness of the system and improve the capabilities of the SRBs. While these modifications were also part of the test program, the focus lay on the added fifth segment and how it affected the thermal and structural dynamics on the booster. The addition of a fifth segment also increased the length of the booster where it became necessary to add a second mid-span support structure to the test stand in order to reduce sag in the booster and optimize the simulation of a vertical posture as seen in flight. High-speed cameras captured video from different angles at thousands of frames per second, including a camera staring down the barrel via a mirror in front of the booster nozzle to document the ignition within the booster. The propellant is packed into the booster to support a thrust profile calling for maximum thrust to be delivered in the first twenty seconds of the flight followed by a slight decline around the time SLS will pass through the area of Maximum Dynamic Pressure before again delivering a high thrust until a sharp tail-off at the end of the burn. Also put to the test was the booster’s hydraulic nozzle gimbaling system, commanded through a pre-programmed duty cycle to record the booster’s behavior when moving its nozzle for Thrust Vector Control. Real time calls during the test did not identify any obvious abnormalities, but the success of Tuesday’s SRB firing can not be confirmed until data from all sensors has been scrutinized by engineers. 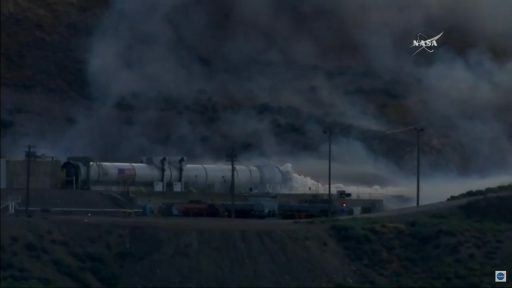 The booster was preserved in its burnout condition by quenching any remaining fire by injecting a large quantity of Carbon Dioxide into the booster via a fire extinguisher that swung around into the nozzle after burnout plus and aft CO2 inlet. Water will be sprayed on the booster for several hours to provide cooling. Forensic tests on the booster will focus on a number of areas that are critical to the booster’s operation such as the nozzle and the field/factory joints between the individual elements of the booster that need to be perfectly tight, not letting any hot gases escape from the SRB. Engineers will be looking at erosion in the insulator and the nozzle to determine the thermal margins of the booster to ensure a safe operation in all flight scenarios once part of the Space Launch System. Unlike the Space Shuttle, SLS will not re-use the Solid Rocket Boosters allowing weight reduction through the removal of the parachute systems that were used to softly return the Shuttle SRBs to the Ocean for recovery and refurbishment. However, booster segments flown on the Shuttle will be used for the assembly of the SLS boosters. 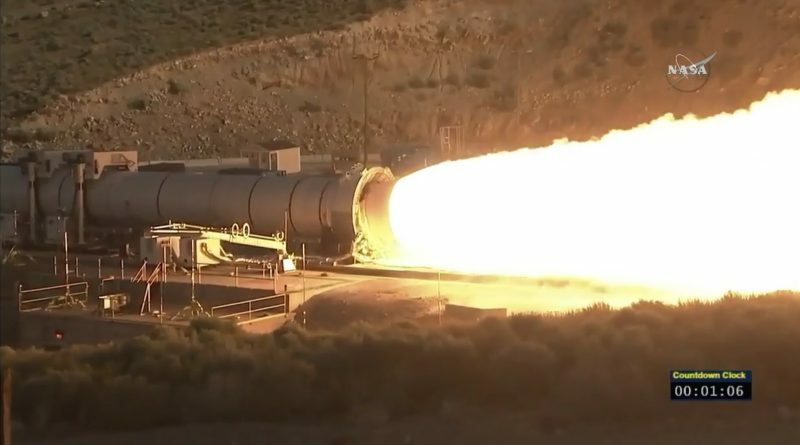 As such, Tuesday’s test included segments flown on forty Space Shuttle missions and fired during seven ground tests – only one segment was newly built. The twin boosters of SLS will deliver 75% of the total liftoff thrust, operating alongside the four RS-25 engines of the core stage that can also look back at a former career powering the Space Shuttle. In total, SLS – flying in its initial version – will have a liftoff thrust of 39.5 Meganewtons, being capable of lifting 70 metric tons into Low Earth Orbit. Upgrades on the SLS upper stage will raise its payload capacity to 90 metric tons with another upgrade to 130mt in the more distant future. 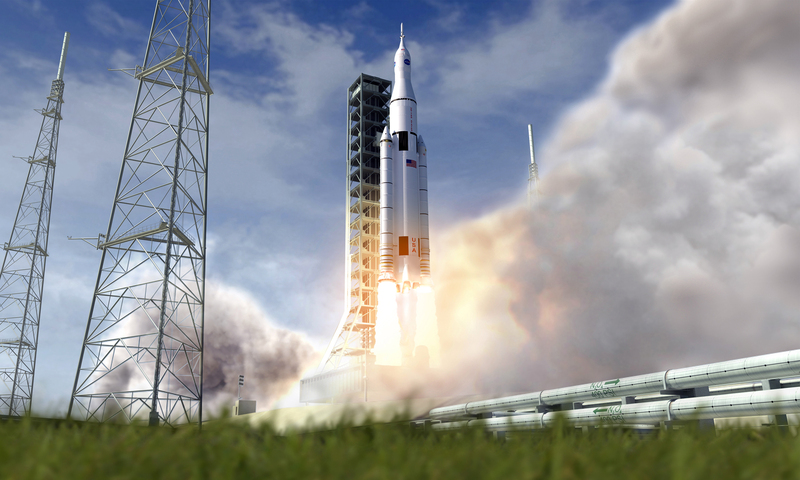 The first flight of SLS is still planned by the end of 2018 to send an uncrewed Orion spacecraft on a mission around the moon as an end-to-end test of SLS and Orion ahead of the first crewed mission that will send a crew into a lunar orbit. The boosters for Exploration Mission 1 are already in production with three booster segments already cast and avionics, aft and forward assemblies currently being worked on to be ready for delivery to the Kennedy Space Center in late 2017.